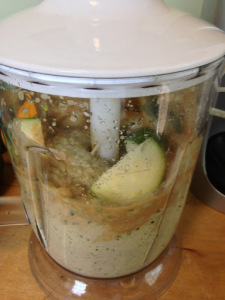 We don’t have this problem this year, but if you have so many zucchini growing in your garden that you just don’t know what to do with all of them, you can try out this hummus recipe. Add your favorite seasoning, like dill, chili flakes, jalapeños, sun-dried tomatoes, rosemary, roasted peppers, olives, or whatever your taste buds desire. 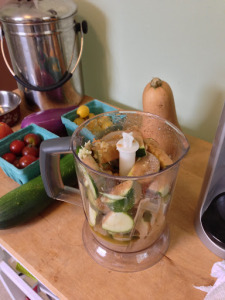 Chop up the zucchini into chunks that’ll fit in your food processor/blender. Put all the ingredients in on top of the zucchini. 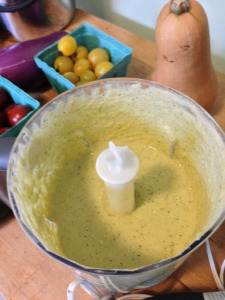 Blend until smooth!